Mariano Rivera (born November 29, 1969) is a Panamanian former professional baseball pitcher who played 19 seasons in Major League Baseball (MLB) for the New York Yankees, from 1995 to 2013. Nicknamed “Mo” and “Sandman”, Rivera spent most of his career as a relief pitcher and served as the Yankees’ closer for 17 seasons. A thirteen-time All-Star and five-time World Series champion, he is MLB’s career leader in saves (652) and games finished (952). Rivera won five American League (AL) Rolaids Relief Man Awards and three Delivery Man of the Year Awards, and he finished in the top three in voting for the AL Cy Young Award four times. 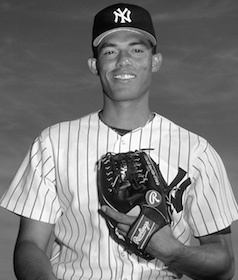 Rivera was signed by the Yankees organization in Panama in 1990, and he debuted in the major leagues in 1995. Initially a starting pitcher, he was converted to a relief pitcher late in his rookie year. After a breakthrough season in 1996 as a setup man, he became the Yankees’ closer in 1997. In the following seasons, he established himself as one of baseball’s top relievers, leading the major leagues in saves in 1999, 2001, and 2004. Rivera primarily threw a sharp-moving, mid-90s mile-per-hour cut fastball that frequently broke hitters’ bats and earned a reputation as one of the league’s toughest pitches to hit. With his presence at the end of games, signaled by his foreboding entrance song “Enter Sandman”, Rivera was a key contributor to the Yankees’ success in the late 1990s and early 2000s. An accomplished postseason performer, he was named the 1999 World Series Most Valuable Player (MVP) and the 2003 AL Championship Series MVP, and he holds several postseason records, including lowest earned run average (ERA) (0.70) and most saves (42). Rivera is regarded within baseball as one of the most dominant relievers in major league history. Pitching with a longevity and consistency uncommon to the closer role, he saved at least 25 games in 15 consecutive seasons and posted an ERA under 2.00 in 11 seasons, both of which are records. His career 2.21 ERA and 1.00 WHIP are the lowest in the live-ball era among qualified pitchers. Fellow players credit him with popularizing the cut fastball across the major leagues. Along with his signature pitch, Rivera was known for his precise control, smooth pitching motion, and for his composure and reserved demeanor on the field. In 2013, the Yankees retired his uniform number 42; he was the last major league player to wear the number full-time, following its league-wide retirement in honor of Jackie Robinson. Rivera has been involved in philanthropic causes and the Christian community through the Mariano Rivera Foundation. He is considered to be a strong candidate for the Baseball Hall of Fame once he is eligible.